The company has acquired expertise as an Exporter and Supplier of Hot Dipped Galvanized Steel Strips in Solan. The Hot Dipped Galvanized Steel Strips, offered by the company, are known for their quality as well as high durability. The company offers the best Hot Dipped Galvanized Steel Strips at the best prices on a timely basis. We are engaged in Slitting Galvanzied Steel Strips As Per Customers Requirements from 32mm to 1380mm. We are offering Galvanized Steel Strap. We offer hot dip galvanized steel strips slitted to required sizes. 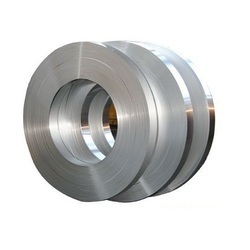 These galvanised steel strips are used for industrial purpose and as per the need of the customer and industrial usage. Riding on unfathomable volumes of industrial expertise, we are providing a broad array of Galvanized Steel Strip. We are a highly acclaimed name in manufacturing and exporting of Galvanized Steel Strips.